Alternator Conversion Kit, with 63 amp alternator. Replacement parts for Kit 6X10300ALTH. Tractors: 2000, 3000, 4000, 5000, 6000, 7000 (1965 & up). 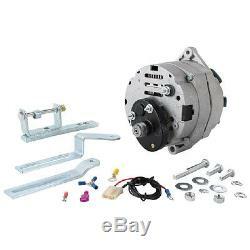 The item "Ford Alternator Conversion Kit fits 2000, 3000, 4000, 5000, 6000, 7000" is in sale since Tuesday, June 21, 2016. This item is in the category "Business & Industrial\Heavy Equipment, Parts & Attachments\Heavy Equipment Parts & Accessories\Tractor Parts". The seller is "griggslawnandtractor" and is located in Courtland, Virginia. This item can be shipped worldwide.